It’s easy to confuse a life settlement and a viatical settlement when you’re doing research. To help you make your decision about whether either of these options is right for you, we’ve put together a brief guide on the differences between life settlements and viatical settlements. Here’s what you need to know. A life settlement or “senior settlement” is a financial transaction where the owner of an unwanted life insurance policy transfers ownership and beneficiary rights to an institutional investment fund. In exchange for transferring ownership, the insured receives a cash settlement that can often be four times greater than the cash surrender value. A life settlement is not a loan, it is a one-time cash transaction that results in a full transfer of ownership in exchange for a lump sum. The money belongs entirely to the policy seller and can be spent at his or her discretion. A viatical settlement is the sale of an existing life insurance policy at a discount form its value for cash. This type of settlement is offered when the insured is terminally ill — designed specifically for those who have a two to four-year life expectancy. If an individual knows they will have costly medical bills that need to be taken care of upon their death, they will invest in a viatical settlement to ensure that their family is not left with the financial burden of paying off those bills. The idea is that the money the terminally ill gets from the settlement is to go towards medical expenses during this two to four year period. Since viatical settlements are based on the speculation of death, it’s essential that potential policyholders fully comprehend the basics of viatical settlements in relation to their current situation. Due to the time value of money, the longer the life expectancy rate, the cheaper the policy will be, and the longer an individual lives, the lower the return is. Due to this, it’s highly important that you invest your time with a viatical settlements company that’s both reputable and has your best interest at heart. A life settlement is a trade between the policyholder and the purchaser. This type of settlement is designed for those with longer life expectancies. Life settlements are designed for those with longer life expectancies. Life settlements are fantastic as they allow the policyholder to obtain cash for an unwanted or unaffordable life insurance policy. In turn, they get to enjoy financial relief and have the option to spend the funds however they choose to. The benefit to selling a life insurance policy in the event of retirement or old age is that the insured will obtain significantly more money than if they were to simply surrender the policy or allow it to lapse. There is a lot of overlap between life settlements and viatical settlements. But, there are very important distinctions between them. Viatical settlements are reserved for people who have a serious medical diagnosis. Examples of this include someone diagnosed with cancer, ALS, or Alzheimer’s. In contrast, with a life settlement, you don’t necessarily need to be ill, but you typically need to be over the age of 70. Generally, viatical settlements payouts tend to be larger, due to their specialized nature. Viatical settlements are also completely free of income tax. When you receive a viatical settlement, you get to keep the whole thing. In contrast, you may have to report the funds you receive from a life settlement as income on your tax return. 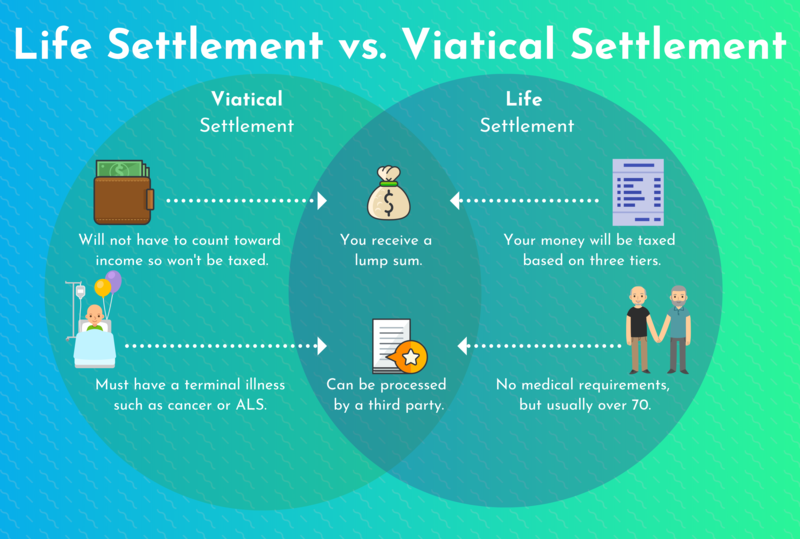 Should You Get a Life Settlement or a Viatical Settlement? A viatical settlement is the sale of an existing life insurance policy at a discount from its value for cash. This type of settlement is offered when the insured is terminally ill — designed specifically for those who have a two to four-year life expectancy. If an individual knows they will have costly medical bills that need to be taken care of upon their death, they will invest in a viatical settlement to ensure that their family is not left with the financial burden of paying off those bills. The idea is that the money the terminally ill gets from the settlement is to go towards medical expenses during this two to four year period. Does A Viatical Settlement Make Sense For Me? Once you’ve determined what type of settlement fits your situation, you need to find the best company to work with. Some companies specialize in life settlements while other entities focus solely on viatical settlements. Some companies specialize in both types of settlements. At American Life Fund, we have extensive expertise in both settlement types. We have helped hundreds of individuals with life-threatening illnesses to sell their life insurance policy for immediate funds. Additionally, we have helped countless senior-aged individuals to sell their life policy for cash. To learn more about how we can help, contact us today at 877-960-2352 or fill out our simple form to see if you qualify for a settlement.